This is really important for me as it shows that the Taskforce delivers on its promises - if we commit to doing something, we do it! We couldn’t have done all this - and lots more - without the three secondees from the library sector who have been working as part of the Taskforce team. We decided to run the secondee programme as part of our support for workforce development, and the benefits exceeded even my (pretty high!) expectations. As a result, we are looking to take on more secondees over the next year. Alongside all of this, SCL have continued to develop their Universal Offers. 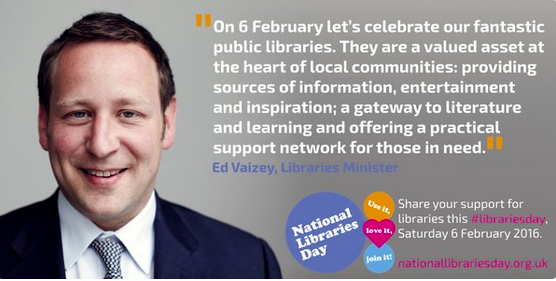 They have been a driver for innovation and provide a framework for partnership development at a national level, delivering tangible benefits to library services within local communities. That’s why I was particularly pleased to see that SCL have secured £300,000 per annum for the next 2 years from Arts Council England to enable them to build on and embed the Universal Offers across the library network as well as develop a new Cultural Offer. But what about the Ambition document? Those of you who read our first report will remember that, in it, we recommended to DCMS and LGA (our joint sponsors) that they produce a document that set out the government’s and the Taskforce’s shared vision for public libraries in England, including how it would be achieved. This recommendation was accepted, and DCMS asked the Taskforce to produce a draft document for consultation. Libraries Deliver: Ambition for Public Libraries in England 2016-2021 was published on 23 March 2016. The Taskforce is currently seeking views on this draft document - the consultation closing date is Friday 3 June 2016. After this, we will work with DCMS and the LGA to publish the final Ambition document in summer 2016. I talked earlier about our ongoing projects, but of particular focus over the next few months will clearly be completing the consultation on the Ambition document and then getting it ready for final publication. The final document will include an action plan which will then provide the focus for future Taskforce activity. Our next official progress report isn’t until September 2016 but, in the meantime, we’ll be keeping everyone up to date on what the Taskforce is up to here and via twitter.